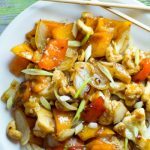 Kung Pao Cauliflower is the healthy version of Kung Pao Chicken. Cauliflower marinated and cooked in a spicy sweet Kung Pao sauce for a quick and delicious dinner. This zippy dish is low calorie, high fiber, vegan and will have everyone wanting more! Make Marinade - mix oil, amino acids, rice wine vinegar, hot sauce, maple syrup and 1 Tbsp of red pepper flakes and place in a plastic storage bag. Add cauliflower and let it marinate for at least 15 minutes. In a saucepan, add both the marinade and cauliflower, bell peppers and onion. Cook over medium-high heat for 5 minutes. With the mixture simmering, add garlic, remaining 1/2 Tbsp red pepper flakes, and peanuts. Cook another 5 minutes. Mix water and cornstarch to make a slurry. Add slurry to the simmering vegetables and stir constantly for approximately 3- 5 minutes or until desired texture is reached. Before removing from heat, add sesame oil and stir. Top with scallions and serve.